I was sent an interesting email yesterday about a fashion initiative by the Accor Hotel Group called "Style Our Threads". The hotel group is going through a period of change creating a new identity for it's Ibis Hotels. Ibis will soon become known as a family of brands: Ibis, Ibis Styles (formally All Seasons Hotels) and Ibis Budget (formally Formulae One Hotels). With the new branding of the company Ibis are looking for new uniform designs that showcase their new identity. Ibis Hotels in conjunction with the Whitehouse Institute of Design are holding a competition to find new uniform designs for the three new Ibis brands. Students at the Whitehouse Institute of Design will be working under the mentorship of Australian fashion designer Charlie Brown to come up with a series of designs that will go to a public vote on the Ibis Australia Facebook group site. Those who vote in the competition go into the draw to win prizes from Charlie Brown and Ibis Hotels. Designer Charlie Brown will choose her favorite fifteen designs to go to a vote on the site. The Facebook community will have the opportunity to vote throughout July for their favorite design. The top three most popular designs will move onto the next stage which will involve samples being made of the three designs which will go into a fashion show to be held at the Whitehouse Institute of Design during the Spring where a winner will be chosen. The winner will receive a one month trip to Italy to study at the Academia Italiana Florence Fashion School and all three finalists will receive a three month mentorship at Charlie Brown. 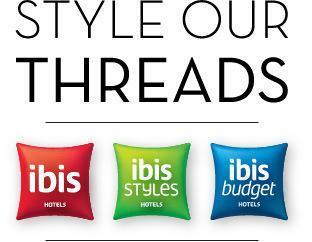 The designs will be rolled out across all Ibis Hotels in Australia in 2013. Thankyou to Red Agency for providing the press release and video for this awesome initiative!